Is your carrier not listed? Tell us. Full number including area code. I know my phone's SMS address, let me enter that. I don't know, go back & enter my carrier & number. Any emails sent to your new email address will be received on your phone as a text message. Note that standard text message rates may apply. MailBliss is a free email service that allows you to get an email address for your phone. Any emails sent to your new mailbliss email address will be forwarded to your phone as a text message. Why do I need a MailBliss email? MailBliss messages are sent to your phone as SMS text messages. 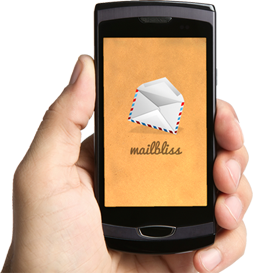 Therefore, a MailBliss email address will allow you to receive emails as text messages without the need for a data plan. If you want to communicate via text messaging but don't want to share your phone number, a MailBliss account will allow you receive text messages while keeping your phone number hidden. The standard SMS email format that is available from your carrier is often hard to remember, while a MailBliss email address is much easier.